For a small charge a traditional rowing boat - based on the Suffolk punt design - can ferry adults, children, dogs, bicycles, buggies and pushchairs across the river Blyth to and from the Walberswick and Southwold banks. The ferry operates on various dates within the popular high summer holiday weeks, as well as during the school holidays of Easter and half-terms, carrying up to 12 passengers at a time. This way of crossing the river is an alternative to walking inland to the Bailey Bridge footbridge - see The Walberswick Map. Operated on demand so will just take you across when you turn up, no need to book. £1 per bicycle. Dogs and children under 5 welcome free of charge. Buggies and pushchairs welcome too. The above times can change occasionally due to extreme weather and tide conditions. 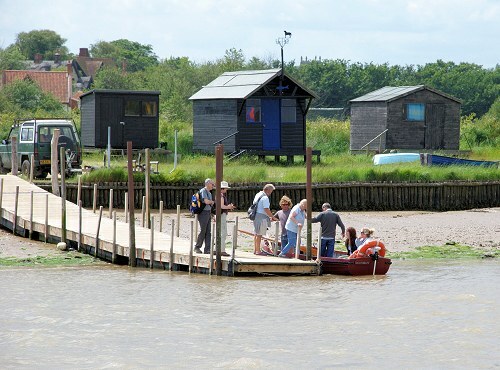 The Southwold to Walberswick Ferry is licenced by Waveney District Council.